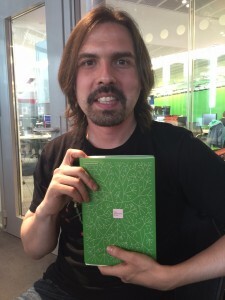 Yesterday my dear husband (@ruskin147) interviewed César Hidalgo (@cesifoti) about his new book Why Information Grows: The Evolution of Order from Atoms to Economies for next week’s edition of Tech Tent (19 June) on the BBC World Service. I’m very excited about reading this book. I’ve long been a fan of The Atlas of Complexity, on which Prof Hidalgo has worked. Besides, here is the overlap of information, complexity and spontaneous order, computing and economics – what’s not to like? Economists will naturally think immediately of Hayek’s famous 1945 article, The Use of Knowledge In Society, which is cited in the introduction here. Although information asymmetries are huge in many areas of economics now, I still don’t think we work out often enough or in sufficient detail the implications of information mattering so much. For years – since the mid-90s – I’ve been saying to colleagues that information technology is a profoundly important deal for economic organisation and even now too often get the reaction, well we know how to handle a transaction cost reduction in our models so what’s the big deal? Anyway, I’m immensely looking forward to reading this and will report back. This entry was posted in Main Page and tagged complexity, information by Diane Coyle. Bookmark the permalink. Do you think this will change when we live in an era where ‘Big Data’ has become a buzzword? Many of the biggest companies now make their money from accessing information.